I never understood why Google paid 1.65 billions for youtube, when the latter only had $15 million in revenue (Bear Stearns / Robert Peck) and I definitively don’t understand google’s business model, which is making the stock going from an IPO of $100 to $543.30 (as per today’s close), but I cannot stop admiring a company so innovated, so brilliant, and so damn cool I really wish I could get a more insightful study about them. Past examples of Google’s Social Responsible actions had been the featuring of Jane Godall Institute, along with the crisis in Darfur, UNEP, and the World Wildlife Fund (the other WWF). The new iniciative debuts with three cool layers: Global Heritage Fund, Earthwatch Expeditions, and Fair Trade Certified. 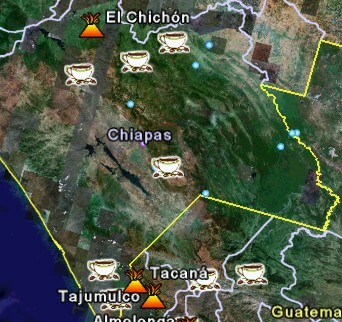 Now you can see where your Fair Trade Coffee comes from. I hope that soon places with certifications from other organizations, and more products, are featured here. It is impossible to keep talking about sustainability and fair trade without talking about Porter’s diamond model. In this blog I am committed to find new ways to apply economic law to sustainability models, so good social and environmental behavior can makes economic sense, and competition, trade barriers, and supply and demand are part of any economic environment. Economic growth is linked with economic competitiveness, and there are three different approaches to measure it: the factor model, assessment of trade performance, and assessment of productivity. The first approach identifies critical success areas and compares the performance of different entities/economies in each area; the World Competitiveness Report is a perfect example. The second approach measure efforts to improve the inputs and indicators of outputs. The third approach use cost-based indicators to measure performance. Professor Michael Porter uses the three approaches in formulating his competitiveness model. For Porter, the key question is why some firms in some nations achieve international success while others fail. He analyses why some industries tend to form clusters (Hollywood, Silicon Valley in USA; Bay Street, Ottawa Valley in Canada) and he conclude that nations do not compete between them, rather, it is the firms within a country than must be competitive. Porter includes also two more factors: chance and the impact of government. Factor conditions are divided between basic (human and physical capital, available general knowledge, infrastructure) and advanced (specialized knowledge). They are also divided between generalized and specialized. Demand conditions are the market characteristics of a given industry, e.g. large versus small markets, scale economics, and quality of demand of domestic market. Related and supporting industries are the complex industrial economies, with its network of suppliers integrating the production chains. For Porter, the relation between supplier and company is of capital importance. Strategy – Structure – Rivalry address the company inner and outer environment. There is no ‘best’ managerial style, but there is a ‘better adapted’ to the company’s circumstances managerial style. Porter stress the importance of strategic goals and the company approach to risk. The domestic rivalry ensures the development of sophisticated and specialized sector; it is only natural that Porter opposes the creation of monopolies, as they inhibit the development of international competitive firms. Porter believes the Government is not part of the diamond, but has the role of facilitator. He acknowledges that chance is a factor in the development of companies, since war, technological breakthroughs, and other factors can influence the competitiveness of any organization. We will use this and Porter’s Five Forces Model later analysing Fair Trade and sustainability. Organic Versus Local, How to Eat Ethically? When we eat organic products we are assuming that they are healthier for us and they are better for the environment. We can define organic products as “food from plants and animals that have been grown without the use of synthetic fertilizers or pesticides, and without antibiotics, growth hormones, and feed additive”. The lack of artificial enhancers makes us think that they are better for our heath and the environment. While the former statement may require an entire study that is out of my scope, the latter certainly makes my sustainable-sense tickles. Organic food humble start was in the farmer’s markets across Europe and Anglo America, where local producers offered their products directly to consumers. “Organic” and “local” were almost synonymous. Then the trend caught in with the big supermarkets and the local component was effectively removed from the concept. Local farmers’ and small markets are important because they boost local economy and help to develop rural areas close to large cities. With the arriving of juggernauts like Wal-Mart and super stores, the rural local economy suffers set backs that end up hurting everybody in the local community. Buying local is always a good way to keep certain amount of business in the region. In markets like Northern America or Northern Europe, the climate doesn’t allow organic food to be produced year-round. Organic food need to be transported from the southern areas, polluting all its way to the supermarket. Bill McKibben declares that growing and transporting a single calorie worth of lettuce from California to his home in Vermont consumes about 36 calories of energy. Consuming organic food that is not locally produced may ending up hurting the environment and the local economy. The pollution caused by its transportation may offset the benefits of not using chemicals in its production. Actually, some pesticides are used in growing organic food: ryania, sabadilla, and rotenone, so the ecological benefit is even smaller than thought. http://www.oneplan.org/Crop/OrganicPestCtrl.shtml includes a complete list of pesticides used in organic farming. NAFTA and GATT have about as much to do with free trade as the Patriot Act has to do with liberty. I think I don’t need to add more, along the States considering promoting free trade as a one-way street. It is easy when we are in prosperity to give advice to the afflicted. Engineers Without Borders launched an initiative this week to end poverty in 2020. They edited a newspaper with the main headline “Worldwide celebrations: End of extreme poverty declared”. They outlined three steps to end extreme poverty: Fair Trade, Aid, and Corporate Responsibility. If only that would be so easy! Fair Trade is one of the most important movements to help end extreme poverty. If I finally can start my PhD, Fair Trade will be a very important component in my research, and my final thesis on my MBA was about Fair Trade, as you can read in many of my post (check out the fair trade category!). In reality though, fair trade is not an end by itself. I found out that, while we want people to receive fair prices for their products, as long as they continue producing the same goods in the same way, they will continue to be poor. Fair Trade only accounts for 5% of coffee and chocolate market now, and even less for other products. Even the newspaper states that fair trade are “most notably coffee, but also chocolate, sugar, cotton and more”. Can we really end poverty focusing in such a reduced products spectrum? International Aid. The paper made a very good observation about the quality of international aid offered by Canada and other developed countries: “Today, roughly 40% of our international aid comes with strings attached – it’s “tied” to purchases of Canadian goods and services, rather than being used to buy the most appropriate or inexpensive items available. It’s estimated that fully 50% of Canadian food aid is tied”. But several scholars, included Jacques B Gelinas have questioned the efficacy of international aid for solving poverty. Corporate Social Responsibility is the strongest point. With the rise of active shareholders and social and sustainable index, companies are forced to do a better job to create and share wealth among society, but only a small part of the world is employed by these corporations. An ethical code of conduct shall be adopted by all the companies, even those small and medium, to behave in the business world. I can still recall how the worst cases of workers abuse in my country are not inflicted by international corporations but by small business that still discriminate by age, gender and physical appearance. I hope that we can follow Karl Marx’s directive of nobody having in excess while others lack the essential. Is Free Trade Fair Trade? Expecting the world to treat you fairly because you are a good person is a little like expecting the bull not to attack you because you are a vegetarian. We will assume, for sake of simplicity, that fair trade takes place between a undeveloped country (the seller) and a developed one (the buyer), but it is meritorious to mention that fair trade also applies for commerce within a country (like Mexicans from the city buying coffee from Mexicans from Chiapas). According to Fair Trade USA, there are 20 fair trade certifiers worldwide working with over one million farmers. But recent studies by the World Bank conclude that the benefits of free trade and economic liberalization have failed to reach the world’s poorest people. Paul Rice notes that many of these “victims of globalization” are small farmers in the developing world. Fair trade is a market-based approach to solving global poverty, he explains, one that helps make free trade work for the poor. Suggestions that “unfair’ products may be taxed or that imports have to comply with ILO standards have led to criticism from free trade advocates and even fair trade promoters are cautious when demanding protectionism or international intervention. Fair trade is seen as paternalism in international commerce. The emphasis is that is the lack of free trade what is affecting developing nations: Protectionism, quotas and agricultural subsidies from the developing world are affecting third and second world producers. The idea of fair trade is paying a fair price for the product of the work of different farmers and workers. One of the global implications is that, in perfect market conditions, the price of a product would be fair since the producer will not be willing to sale at a lower price of a given amount. Free trade will equals fair trade (Brink Lindsey, Milton Friedman). · The fluctuation of commodity prices doesn’t guarantee a living wage for many producers, forcing them into debt and poverty. In the 1980’s, the US government policy provided $260 billions to American Farmers. In 2008, the final NAFTA protections to Mexican bean and corn will fall, leaving poor Mexican farmers alone against the most subsidized farmer economy in the world. These imperfections make very difficult for smaller traders to compete. The argument is that multinational companies are able to benefit from subsides and protections that small economies cannot provide. The economic situations that these imperfections bring may fire backwards to developed countries when illegal immigration and terrorism are exported along with the goods. Flora and fauna extinction, social unrest and deforestation are faced in producing countries as result of poor economic conditions, like Chiapas in Mexico. Covers the costs of production. Allows the peasant or worker to actually make money. Allows the peasant or worker to work on safe conditions. buyer will pay a willing seller, but given the mentioned market imperfections, we need a measure to determine what would be a fair price for a given product. “The Myth of Fair Trade”, James Bovard, Cato Policy Analysis, Nov 1, 1991. The U.S. government spent $2 billion in 1986 to flood international markets with American rice, driving down the world rice price by 50 percent. The Thai rice program spent less than $100 for each Thai rice grower, while the U.S. program spent the equivalent of over $l million for each full-time American rice grower between 1985 and 1990. Thailand’s average per capita income is $860, while the average American full-time rice grower was a millionaire even before receiving lavish subsidies in the mid and late 1980s. http://www.fairtrade.org.uk/about_what_is_fairtrade.htm, retrieved on April 2006. Washington lawyer David Palmeter observes: “In the U.S., exchange rates in anti-dumping proceedings are determined by applying an outdated regulation, a relic of an era that ended in the early 1970s when the fixed exchange rate system established at Bretton Woods was abandoned. . . . The rate established by the Federal Reserve is a quarterly one, set in advance, and based on transactions at the end of the previous quarter. . . . This average rate is used throughout the quarter unless, on any particular day, it varies from the average by more than five percent, in which case the daily rate is used.” N. David Palmeter, “Exchange Rates and Anti-dumping Determinations,” Journal of World Trade 22, no. 2 (1988): 73. The depreciation of the Brazilian real from 1.20 to the dollar in January 1999 to 3.60 as of January 2003 has caused Brazilian costs in dollar-denominated terms to fall markedly. “The Politics of Plun der”, Doug Bandow, New Brunswick, N.J.: Transaction Books, 1990. “Los Idus de Julio”, Carlos Fuentes, El Norte, Jul. 21, 2006. “Students Guide to Fair Trade”, Louisa Lyne, Oxfarm, 2006. The author resists to use the term ‘non fair trade’ since he’s trying to avoid the implication that products without the fair trade labeling are unfair. U.S. Department of the Treasury, “Report of the Secretary of the Treasury to the Congress on the Operation and Effectiveness of the Anti-dumping Act and on Amendments to the Act Considered Desirable or Necessary,” 1957, pp. 1819. Fools are not generous: the world of the gods is not for the stingy. Wise men are generous: they find happiness in the next life. A phenomenon exists in Economic Theory that has significant effects in everybody’s life, while only a few are aware of: The Multiplier Effect. Let’s say that, in general, people in a country save 20% of their income and spend the rest. This 20% is called Marginal Propensity to Save (MPS). The opposite factor, the 80% that people spend is called Marginal Propensity to Consume (MPC). Since they are percentages, they always sum one: MPS+MPC=1. Because the money came from international markets, the full $500 is reflected as an actual growth in the local economy. The 20% saving rate in a rural community is rather high. Rural communities in third world have very low savings rates, because they live in a day by day basis; thus, the multiplier effect is even higher, for a community with only 5% saving rate, the multiplier is 1/.05 = 20 times, so the extra $20 per metric ton translates in a $400 injection to the community. A key point that derives from the marginal propensity to consume is the paradox of thrift. If people start to save more money, the bank system will have more money to lend to the industry, thus investment will go up and there will be more good and services, and because people is saving more, their future is more secure. What really happen is that now people are spending less, so the demand curve for all goods and services shift to the right. As consumption decrease, so the economy; people start getting fired, companies have to decrease production, and the general income shrink. As income falls, so the savings. People were trying to save more, but they really ended up saving less. This is why economies like USA’s promote overconsumption, so the economy never shrink. The people live over their limit because the way the economic sectors are integrated, spending more makes the economy grow. You are currently browsing the archives for the Fair Trade category.